I am so determined to stay on top of these monthly updates for the rest of this year. It’s not because I am feeling pressure about it, but just recognizing how hard it was to back track and write a true updates in retrospect for months three and four. I am sure I forgot bits and pieces. I really want to have these updates for Otis, though, just like I did for Eleanor. 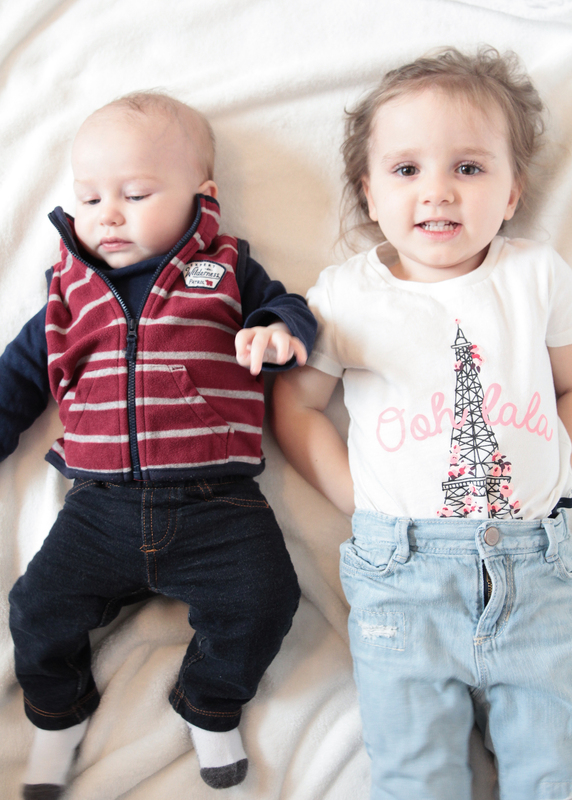 So month five! 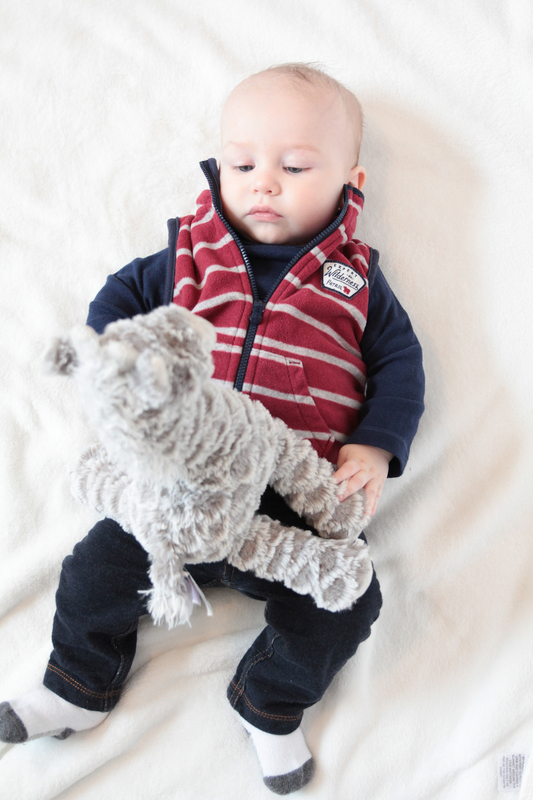 I cannot believe that he’s only a month from being six months old – that just seems impossible. Time is flying! Definitely not a highlight but certainly a “milestone” or something to remember at the very least – Otis’s fifth month started with me getting mastitis. While that is mostly about me, it certainly affected him. I never once got it with Eleanor, and this is the first time I ever got it with Otis. It’s basically the worst, and I don’t ever want to experience that again! All that to say, I was thankful that I had flu-like symptoms with mastitis and not the actual flu that’s been so bad this year. Otis started really sucking his thumb this month. He’s been all about his hands for awhile, but it was always different parts/fingers. There were several times this month that we caught him sucking his thumb. Otis and I went on our first solo flying trip – a very quick trip to Tulsa for some dental work and then right back home. He did a really good job! He also became much more interested in toys. 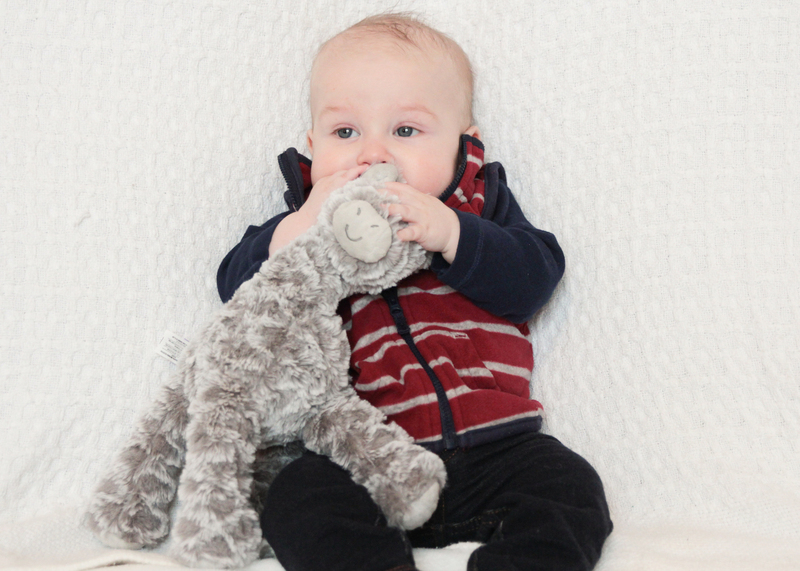 His favorites are the little green crinkle toy that Eleanor picked out for him before he was born. I think it’s an elephant. 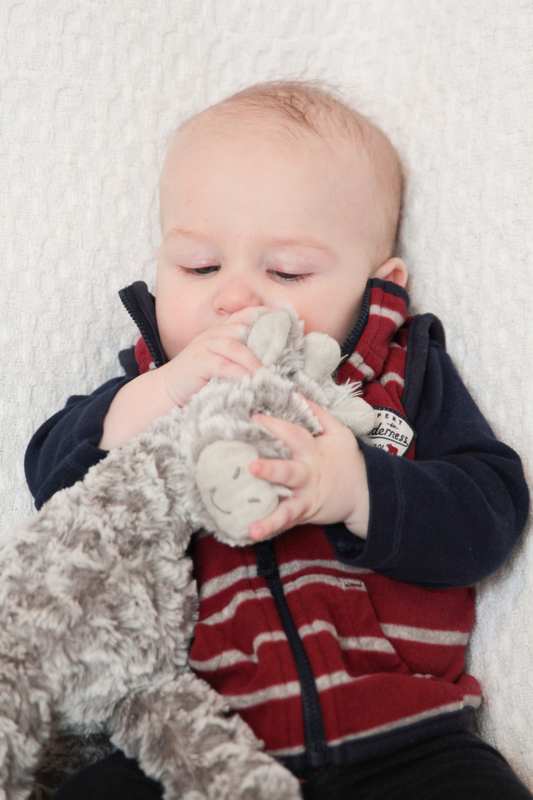 He also loved Eleanor’s Sofie the Giraffe so we got him his own because hers was pretty gross even after being washed. 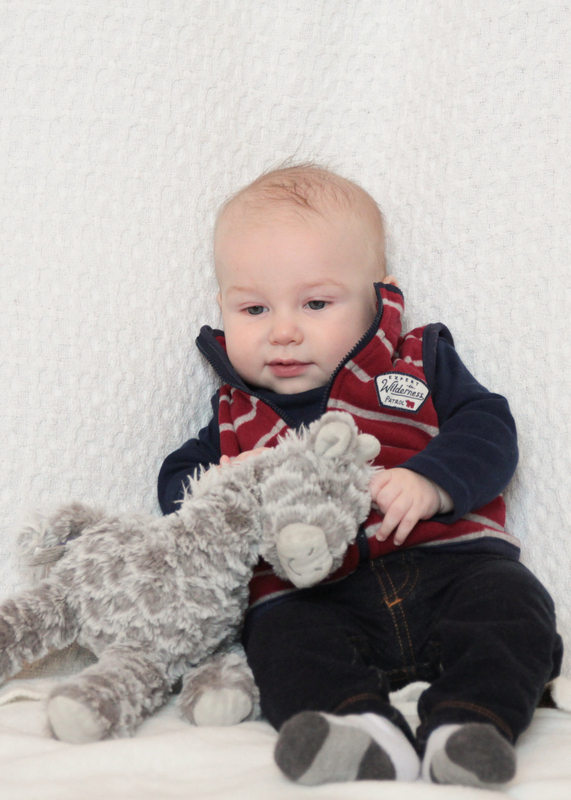 He loves the little grey giraffe stuffed animal that you see in his month to month photos, and he also likes his o-ball. We slowly began some sleep training this month, or at least attempting it. He actually adapted insanely fast to putting himself to sleep, so that’s been a huge win! I think the first night he maybe cried for 2 minutes? It was so short that we didn’t even have a chance to reassure him – he was just like, “Oh ya I can do that. No big deal!” The only time he won’t do it is if we miss the window, and he’s either not tired yet or overtired. That’s a bit trickier. We attempted to start weaning him a bit at night, still doing a dreamfeed, but our plans were thwarted first by mastitis, second by travel and third by teeth. So at the moment, while his second tooth is just about to pop through, the boy is killing me in the sleep department and waking every 1-2 hours at night. I know it won’t stay this way – just a few days until his tooth pops through – but man, am I missing sleep!!! He does a much better job taking longer naps than Eleanor ever did so he can actually go 3.5-4 hours between feeds during the day. That makes things quite a bit easier and more predictable. We’ll get there. He has really started following people when they walk around. He will crane his neck around to follow someone from one side of the house to the other, and when they notice him, he gives the biggest grin. We’ve gotten some “almost giggles”, but they’re still getting interrupted by hiccups. He started sitting in activity center last month, but this month, he started interacting with it a bit more. We also were at some friends’ house, and they had a little jumper for their baby that Otis LOVED. So I hunted around on Facebook marketplace for a good deal and found one. Otis is way more entertained by this than the activity center. Before I looked, though, I told Robbie that we had to eliminate a few of these seats. He had 6! A highchair, a bumbo, a rockaroo, an activity center, a rock-n-play sleeper and a mat for the floor. TOO MUCH! So I sold the rock-n-play and am trying to sell the bumbo. We are giving the rockaroo back to my Aunt who it belongs to, and we put the other activity center in the attic for now, although I may sell that too. Now he has 3! Much better!! Finally the biggest milestone is that Otis got his first tooth! I was so shocked because it’s such a different experience than what happened with Eleanor. I feel like we waited for-eeeeever for Eleanor’s first tooth. I think she was 8 months. I wrote this post in all the waiting, thinking it was any day now for months. With Otis, I noticed he was drooling a ton and chewing on his hands, and then one day, I noticed his gums were white. Then the next day, he had a tooth! He’s about to get his second one, too! Jumparoo chair – absolute fav! I was so ready for January to be over, not because it was bad but because it felt insanely long. However, I found February to be rough. We attempted a Whole30, but honestly, with each thing that came up, it felt like too much so it became a Whole15. 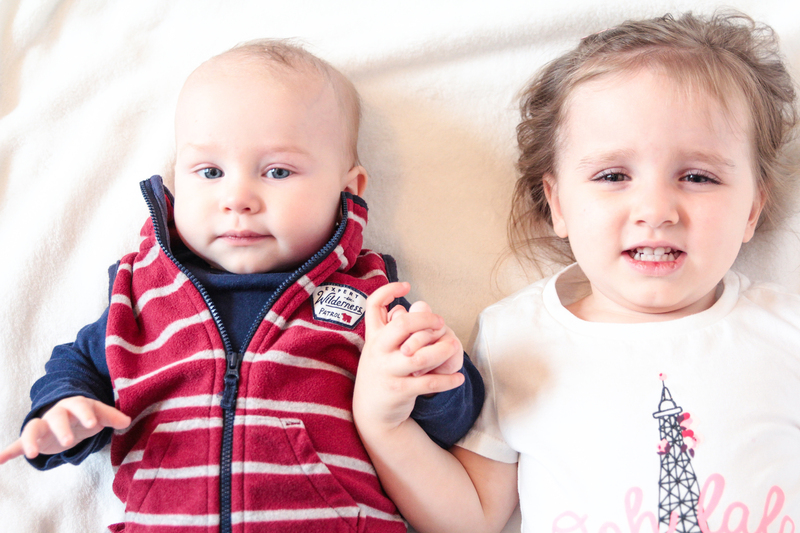 Mastitis, a lot of teeth trouble, Eleanor getting sick – those were some major things that happened this month. The teeth stuff in particular were very hard because one, I really don’t like the dentist, and two, I was losing hope that my teeth were ever going to feel normal/not in pain again after being in some level of pain since my appointment in December. Fortunately, I had a root canal. That’s a sentence I NEVER thought I would say, but it is so true. That really helped things out so much, and now, I hopefully just have to get the permanent crowns put on and I’m done. The root canal was actually a very redemptive experience. I wasn’t able to have anything to help with anxiety – laughing gas or anti-anxiety medication – and I did fine! I surprised myself actually. They did such a good job, and I am actually thankful for the experience. Other than that, it has helped a lot that Otis is putting himself to sleep for most naps and usually taking good naps. That helps the whole day and for me to feel like I can accomplish a thing or two. We still don’t have a huge routine as a family yet because Robbie hasn’t started working full time yet. I think that will make a big difference for all of us. We’ve tried 6 churches at this point, and I think we are feeling to go to this last one for now. It really ticks all the boxes of what we were looking for, and we’ve met some lovely people there as well. We’ve been on a couple dates this month, which was awesome, and we’ve continued doing our Financial Peace Course. We are learning A TON in this season of transition, and I am currently still exploring and praying into some possible directions for my future that fit within the broad vision God gave me. It’s scary and exciting all at the same time, but I think new seasons are often that way. Overall, I am doing well – some challenges of course but some wonderful things happening as well. I am grateful for this new season! What is it with kids and giraffes?! Mine love them too! He is so precious. Good job on the updates mama!